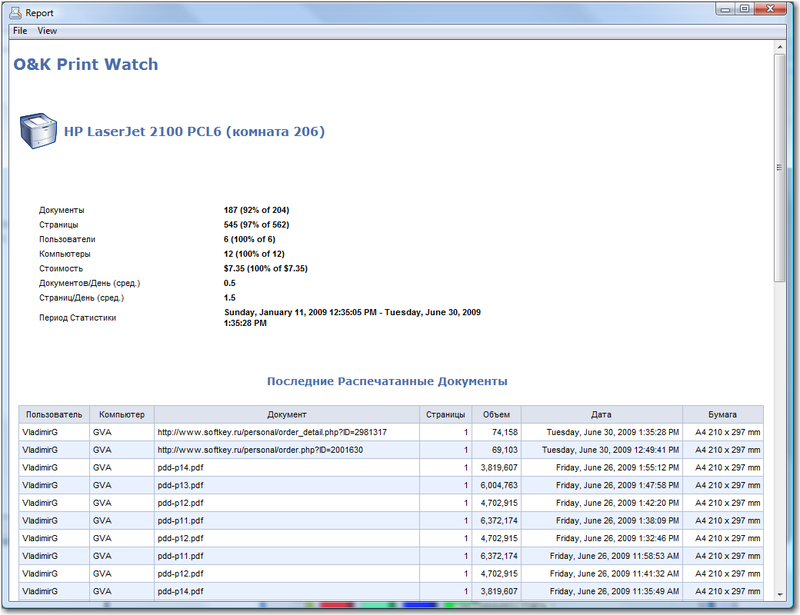 O&K Print Watch has a built-in printing report generator. The reports can be printed out or exported to HTML or XML. To create a report for a selected object (server, printer, user, or user group), select Report → Run report in the menu. General — A report that includes information on a given object, and also information on the last documents printed by the object, as well as the most active users, printers, and computers. Details — A report on all documents printed by a given object. To change the type of report, select View → General/Details in the menu. By default, each report is based on the last 1000 database entries. To change the reported period or the number of database entries for an object, select and right-click the object in the tree on the left side of the window, and then select Report → Parameters in the context menu. Here you can also set up filtering by document name, the number of pages, cost, size, color, or duplex. 1As a Web document (in the MHT format) for viewing in a web browser. 2As an XML document for exporting and editing in other programs, such as Microsoft Excel. To save a report, select File → Save As in the menu. To print a report, select File → Print in the menu. 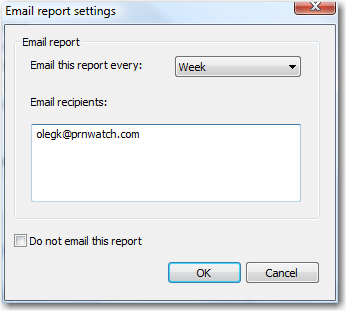 Each report can be automatically emailed to a group of recipients. Select File → Schedule emailing in the menu, and enter the recipients’ addresses and emailing frequency (daily, weekly, monthly, or annual). The report will be emailed to the recipient at 00:00 of the set period. IMPORTANT: To enter the address of an SMTP server for sending emails, select Properties → SMTP settings in the print server object’s right-click menu.